Tune in to hear about open positions, recruiting logistics and timelines, and testimonials from alumni. Registration is required, and you can select as few or as many webinars as you would like. Learn how to get noticed by American employers, improve your American-style networking skills, and navigate H-1B sponsorship. We'll cover what you need to do to succeed in your MBA internship or job search in the US or abroad. 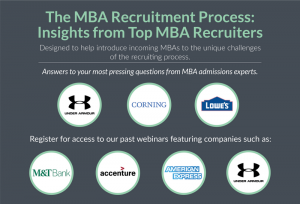 Presented by RelishCareers and The MBA Exchange, this webinar features veteran McKinsey and BCG consultants from The Consulting Career Academy who will share their insights, advice, and best practices for incoming MBAs interested in the consulting industry. 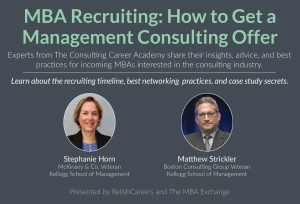 Join Stephanie Horn (former McKinsey and Kellogg Alum) and Matthew Strickler (former BCG and Kellogg Alum) as they run through the recruiting timeline, networking best practices, and case study secrets you'll need to know to land a top-tier consulting internship. 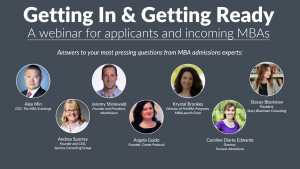 For applicants and admitted students headed to graduate business school next fall, the team at RelishCareers presents a series of exclusive conversations with MBA Admissions Consultants, Career Coaches, and other b-school experts. Learn how best to build a target list, optimize your applications, select the best-fit school after admissions decisions, and prepare yourself for two intense years of business school.